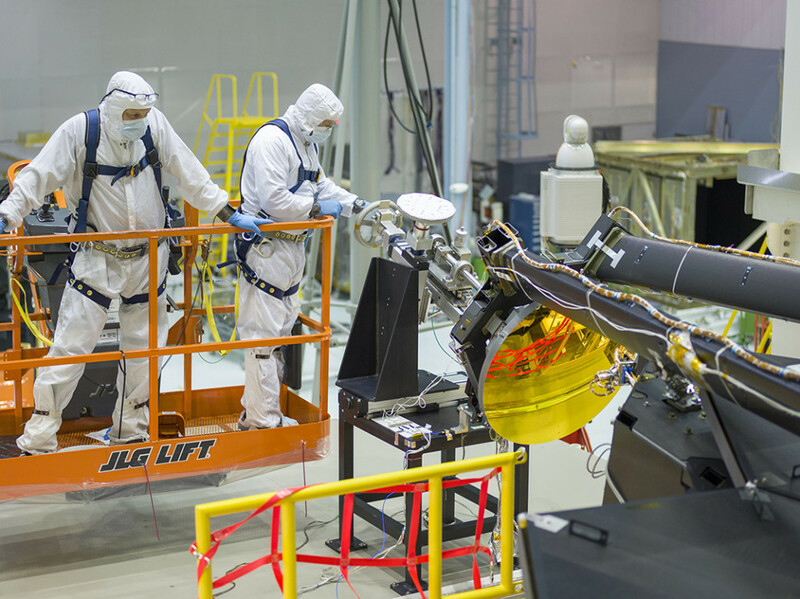 March 9, 2016 – The sole secondary mirror that will fly aboard NASA’s James Webb Space Telescope was installed onto the telescope at NASA’s Goddard Space Flight Center in Greenbelt, Maryland, on March 3, 2016. The Webb telescope uses many mirrors to direct incoming light into the telescope’s instruments. The secondary mirror is called the secondary mirror because it is the second surface the light from the cosmos hits on its route into the telescope. Before its launch, engineers must build and test the telescope rigorously to ensure it survives its launch and its trip one million miles out into space. The James Webb Space Telescope is too large to fit into a rocket in its final shape so engineers have designed it to unfold like origami after its launch. That unfolding, or deployment, includes the mirrors on the observatory, too. Unlike the 18 primary segments that make up the biggest mirror on the Webb telescope, the secondary mirror is perfectly rounded. The mirror is also convex, so the reflective surface bulges toward a light source. It looks much like the curved mirrors on the walls near parking garage exits that let motorists see around corners. The quality of the secondary mirror surface is so good that the final surface at cold temperatures does not deviate from the design by more than a few millionths of a millimeter – or about one ten-thousandth the diameter of a human hair. The powerful primary mirror of the Webb telescope is designed to gather the faint light from the first and most distant galaxies. The Webb telescope has 21 mirrors, 18 of which are primary mirror segments working together as one large 21.3-foot (6.5-meter) primary mirror. The primary mirror was completed when the 18th and final segment was installed on February 4, 2016 at NASA Goddard. The secondary mirror and all of the mirror segments are made of beryllium, which was selected for its stiffness, light weight and stability at cryogenic temperatures. Bare beryllium is not very reflective of near-infrared light, so each mirror is coated with about 0.12 ounces of gold to enable it to efficiently reflect infrared light (which is what the Webb telescope’s cameras see).